Kumkum Bhagya: In today’s episode of Kumkum Bhagya Dadi and Abhi have reached the house of Sarla and informed her about the Pragya’s act that they got them married. 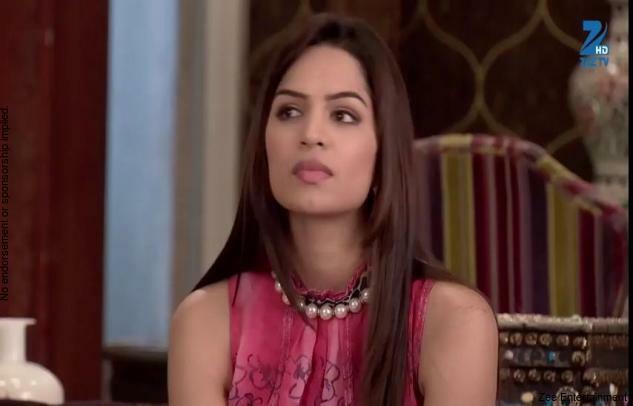 She doubts the right of Pragya to get Purab and Bulbul married. Sarla goes in anger and starts shouting on them and Pragya. Abhi called Pragya in the house, Pragya was threatened. Sarla comes and shouts on her that she doesn’t have any right to get them married and it’s the right of Bulbul’s mother. Pragya justifies that she got them married with happiness. Sarla goes calm down and told her that she is mean and there must be some benefit for her. Bulbul told Sarla that she got married to him because she was feeling insecure and scared off. Sarla happily touches her slap and told that it was her childhood wish of getting run off and married. Alia turns into a devil and put the hot wax from a candle on the bed and make the bed burn. Dasi and Dadi brought them to the room and spotted that something is actually burning in the room. They saw the bed was burning, Alia was hiding behind a curtain. Tanu informed Raj that its all a work of Alia. Bulbul felt the tears badly. She defined her as unlucky and told Purab to spare her off. Abhi comes and changed everyone’s behaviour. He informed that he has bought many gifts for her and she will get happy after obtaining them. Abhi blames Pragya for all this mishappening. Raj bought and slammed Alia for doing all this. She justifies that they get married and doing the same in her house. Raj told her that they will need to sacrifice something to get something. Alia keeps on burning in the anger. Early morning Pragya left the key of Drawer with Abhi on which drawer the papers were kept by him. Bulbul enters the room and sees the papers in his end, Abhi informs her that he has taken the signature of Lady Mogambo on the power of attorney papers. Bulbul advises her not to take the documents with him and Abhi goes to call Tanu. Pragya comes and Bulbul informs her about what all has happened. She informs Pragya that Abhi has gone to bought Tanu in the house, she suggested some idea to her. Purab bought some flowers for Bulbul and shown the flowers to her. He shares the honeymoon idea to her. Bulbul was standing above the stairs, Alia comes from behind and sees her trying to push and kill her. Pragya caught her red handed and bought her in a separate room. In the next episode of Kumkum Bhagya Pragya is going to show Alia her never seen Avatar which would left everyone stunned.